I wasn’t sure what to expect as I walked inside the Forum 8 Theater on Saturday, Jan. 30. With a few tickets for “Kung Fu Panda 3” in my hand — the latest in the popular movie series — I had doubtful feelings about the movie’s quality. With faint memories of “Kung Fu Panda” I had watched years ago, I kept thinking that it would have too many overly childish components which would ruin the totality of my experience. Although it definitely wasn’t the greatest animated film I have ever seen, “Kung Fu Panda 3” didn’t fail to entertain me for the entirety of its 95 minutes with elements of humor, heart and engaging battles. Once again, the movie’s plot largely focused on Po (Jack Black) needing to overcome his setbacks, this time in an attempt to defeat Kai (J.K. Simmons), the main antagonist of the film. Unlike the villains in “Kung Fu Panda” and “Kung Fu Panda 2”, Kai is the first supernatural antagonist Po must defeat. Adventurous fights are quite prevalent throughout the movie. While some are fairly serious battles which truly shape the film, others were peppered with amusing comic relief, which allowed it to be an enjoyable watch for everyone in the theater, especially children. After all, who doesn’t like a healthy dose of action? As someone who doesn’t laugh easily, I found myself chuckling often in reaction to certain comedic occurrences in the film. I was surprisingly amused by the simplicity of the film’s comedy. 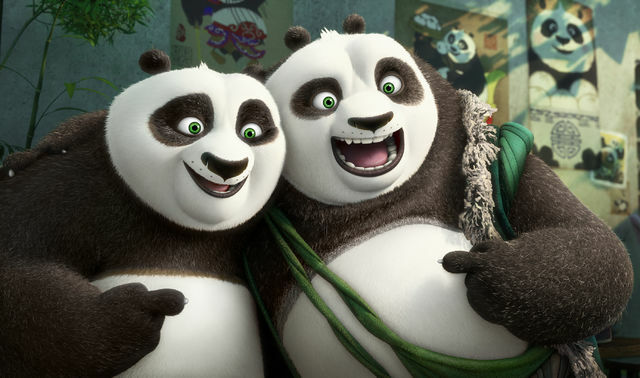 ‘The Kung Fu Panda’ saga is known to be largely based off of children’s comedy, and there’s no doubt that Dreamworks ultimately achieved their goal with this one. I heard several children laugh throughout the theater almost every minute. The mere silliness of it made it a gratifying experience for me. While the comedic aspect of the film was quite delighting for me, I also appreciated how the film was not simply based on hilarity. The movie did have its more deep moments, including a scene where Po’s father, Li (Bryan Cranston), enlightens Po about his long-deceased mother, who died when he was an infant. This was likely one of the most emotional scenes displayed in the film. The fact that the movie’s comedic aspects were sprinkled with such serious moments made it utterly enjoyable to say the least. While this was a pleasing film to watch, the plot was the weakest part. The story line seemed a bit too simplistic to fully engage older audiences like me. While this movie was, indeed, aimed toward younger audiences, a deeper story line with enhanced detail and emotion would have been favorable. Even so, this movie was still a fun experience for me. What truly made it stand out, however, is the fact that it beautifully incorporated comedy, action and compassion together into a absolutely gratifying watch. Humor, adventure and heart were all perfectly blended into the film. The outcome? A satisfying experience for children and adults alike. There’s no doubt about it: Dreamworks has succeeded once again with this entertaining movie. What are your thoughts on Kung Fu Panda 3? Leave a comment below and let us know.